I love soup. I love the warmth on cold days, its simplicity as a meal, how easy it is to customize. It is no wonder that it was the staple, everyday meal for generations past—economical, nutritious, filling—you can find soup recipes for any region of the country or the world. 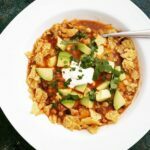 Chicken Tortilla Soup is one of my favorites; I liken it to having a burrito in a bowl. As with any soup, starting with a base of homemade stock is ideal. Sometimes you have stock on hand and sometimes you don’t, so you end up using bouillon and broth as indicated in this recipe. If you have the time, cook and shred the chicken in the morning and use the bones to make stock throughout the day, ready for soup that night. Bring on the heat with extra chilies or tone it down with a little more sour cream and avocado on top. Every steaming bowl can be customized with toppings like your favorite salad bar, sure to please everyone at the table. 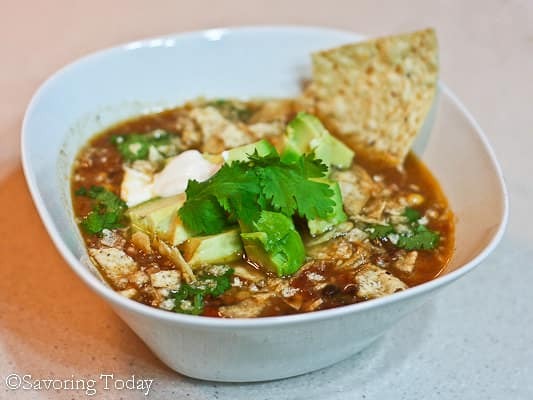 Savory chicken soup with tomato, black beans, and corn tortillas topped with avocado and fresh cilantro. Cut up chicken into 8-9 pieces. Place all parts of the chicken, including the back, in a large pot with 3-4 quarts of water and 1 tablespoon sea salt. Boil chicken until just cooked through, 25-30 minutes. Remove chicken from the pot and allow to cool until easy to handle. Skim broth or strain to remove brownish foam and reserve the broth to make stock at a later time or freeze. While the chicken is cooling, sauté onion with oil in a large skillet until beginning to caramelize, add garlic, and cook until fragrant. Add spices, bay leaf, chilies in adobo, Worcestershire sauce, liquid smoke, chopped green chilies, and salsa; simmer to meld flavors. Add stewed tomatoes and simmer another 10 minutes. In a large pot, add chicken stock an half the beef stock with the vegetables from the skillet. Add the corn and beans; bring to a low boil for 30 minutes. Add chicken and tortilla chips. Depending on the consistency, add more of the beef stock; simmer for 30 minutes. Salt and pepper, to taste. Serve over broken tortilla chips with desired toppings. « Post 100: Gotta say, I’m loving every minute of it! This looks like it would make my taste buds sing! I’ve pinned it for future reference 🙂 Thanks for sharing this with Sunday Night Soup Night, look forward to seeing you again soon! A friend of mine made this last week and loved it, hope it suits you and yours :). I’ll link it up right now. Oh, it definitely suits us 😉 Thanks for linking it up! Last two posts are Mexican inspired dishes, my wife would love these. She always crave for Mexican food. With the snow coming down and the bone chilling temperatures today is for sure a soup day. Thanks for your chicken tortilla soup to try, I look forward to serving to my hungry men who are presently outside trying to get the snow blower to work.